Ah, thank you, @Jacoby_Elderfun1. Love you too. This, really, is too much. I'm too extrordinarily humble for such a title from a moderator such as yourself. Who? How do you even give yourself titles? Was it a moderator? Does member president of the month actually exist or is this just one sorry joke? Thank you so much to the person who did that to @Xonos_Darkgrate1. I had literally just emailed @Coop_Blimppenny about doing that. It's more of a joke. I am the current forums president, I believe (you can check out the thread here). One thing you might not have seen though, was a discussion we had a while ago when the idea was first raised. One of the questions was whether or not could have titles for the Presidency, but the idea was shot down because it would've been too much work for just @Goku_Ironheart or @Hanna_Brassheart to change titles on a monthly basis. Now that we have some more moderators, there's a little bit more liberty to that notion. As you can now see under my username haha. not really a fan of this time travel business. 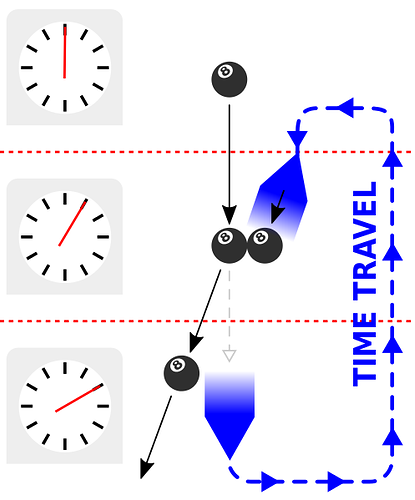 because if that ball went back in time to knock the earlier version of itself off course, how is it able to carry out its time travel act if it changes what got it to move back in time in the first place. it would not be able to move in time. I would like this explained as well. Is it the wishful thinking of a billiards player or a plausible scientific test? Such a test might just cause a time loop in which the ball keeps going around and around forever, Even if you did get it to work once, where would it end? Would the balls begin to multiply uncontrollably? Now that we have some more moderators, there's a little bit more liberty to that notion. Ooh, this will be interesting. Will the presidents be decided by the moderators or voted on by the members? Would the balls begin to multiply uncontrollably? Well, the question is: if the ball was knocked out of the way by its future self how could the future self have been created, but if the future self had never been created how did it knock its past self out of the way of the time travel portal? i just said something relate-able to that. IT is a paradox for sure. I suppose I must revert to what I first thought when I first saw the image. It is merely the wishful thinking of a billiards player. Yeah... I looked for you actually when I saw Xonos' but you don't have one. I've added it! Congratulations on your vice-presidency! OOUUUUAAAAAAGH! NO WAY THIS IS THE BESTISTEST! Thank you so much, Hanna!! Whoa! I never knew you could have a name other then the one you came up with or if you are a Mod! That is really cool!!! Can I have a name like Cap'n Hook please! Sorry Cap! We must only use the name plates for special stuff If you win the presidency though, I'd be happy to!